Photo: Michele is the third women from the left. I knew I wanted to become a nurse because I have always had a passion and a drive to be a part of the healing process. I believe that nursing is simply to give tender loving care while applying it to the everyday concept of medical care. Now, I have been a Registered Nurse for eight years, and over these pasts few years I have had the pleasure to work with many talented and compassionate individuals who work in different departments, and within different capacities. Working with these individuals at Northwell Health, I have realized that as a team we can accomplish anything. We are all part of our patient’s healthcare team. Whether it is the nurse, the physician, the nursing assistant, dietary, engineering, the security guard, administration, housekeeping, etc. We are part of a team whose goal is to provide the safest and finest care we can deliver. We are all unique individuals who bring ideas to the table. I became a part of Southside Hospital’s nursing team as a Labor and Delivery nurse. Labor and Delivery is an extremely intense, high-stress level area where emergencies occur daily and I was privileged to work amongst the best team, and with them, we delivered the best care even throughout any emergency. Two years later an opportunity was presented to me to join the Cardiothoracic ICU Fellowship program Northwell Health has. Throughout this experience, I was able to learn some of my best skills from the astonishing cardiac surgeons and the most remarkable nurses that I worked with. After the fellowship, I realized that my true passion was working in the delivery room and I accepted a position as an Assistant Nurse Manager. Taking on this task was a huge endeavor for me. This role is not about being a manager it’s about being a leader for your team. Communicating effectively, listening to others, leading by example, and many other traits are all qualities of the type of leader that I am. The culture of this organization has taught me how to be this way. Empowering one another, supporting one another, and collaborating with one another are some of the characteristics of the culture we have here that help guide me. We are all different and unique in our own way but we treat each other equally and with respect, and our patients receive the best care because of who we are. We are all truly together and that’s one of the reasons why I’m proud to work here. Over the years, the best opportunity that I have been given is the opportunity to change people’s lives. I’ve taken care of some of the sickest patients in the hospital, and within weeks I’ve seen these patients walk out of the hospital. That’s the opportunity that touches me most and reminds me why I love being a nurse. All of my other opportunities remind me why I love being a nurse at Northwell Health. 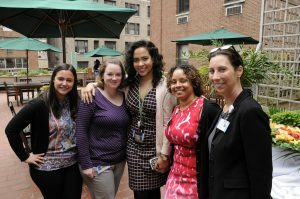 Victory Greens, supported by both Lenox Hill Hospital (LHH) Administration and the health system’s GreenBERG, is a rooftop garden created for everyone who works at LHH to enjoy. Last year, I was given the opportunity to manage the garden, which has been as great a pleasure for me as the success we’ve had for employees. Over 18,000 visits were made to the garden by LHH employees last year, a significant increase over the prior year. Last year, we hosted 8 Snipping Events that were attended by over 600 employees. At the events, employees had the chance to take home fresh herbs and produce from the garden and learn how to use them in new recipes, drinks and more. 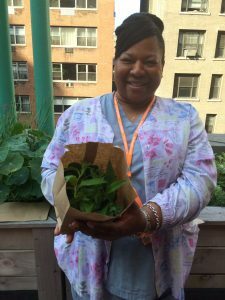 One employee who had never cooked with fresh herbs was so inspired by the garden’s bounty that she changed her entire eating habits. She lost 30 pounds and was able to go off of her blood pressure medicine by the end of the snipping season. This year we are expanding the Snipping Events to include an educational component. We’ll be hosting programs targeting Body, Mind, and Spirit as well as a program on Nutrition and Cooking and one on Exercise. We’ll also be having our first “Mobile Garden” this season, which will allow us to deliver “snippings” to our colleagues at off-site facilities so they may enjoy products from the garden. Recent scientific studies have shown that it is critical for a person’s mental and physical health and overall well-being to have at least one direct touch with nature/day. Victory Greens allows us to have a touch of nature, even on a rooftop in NYC. After a hard shift or a long day, the garden offers employees a place of solace, rest and fresh air, which is important after working inside all day or night. 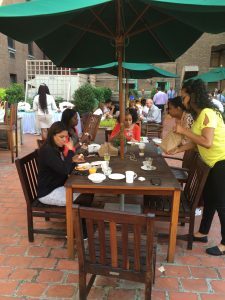 The rooftop garden also presents a wonderful opportunity to meet fellow employees, many of whom would, otherwise, never come into contact with one another. Numerous friendships have been formed over lunch or catching sun rays in the garden. 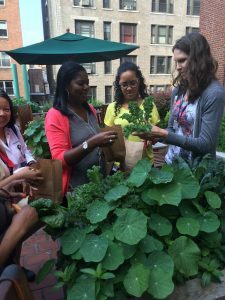 In fact, the garden affords the opportunity to touch everyone in the LHH community, including our patients. Herbs from the garden are used in patient meals as well as in the cafeteria and in the catered events we often host for guests. Fun fact: There’s at least one species indigenous to every continent represented in the garden and nearly 100 varieties of plants, herbs, vegetables, and fruit are currently growing on the rooftop. Victory Greens has also led to the development of a wonderful relationship with our Community Partner, Harlem Grown. Harlem Grown is an organization whose mission is to inspire youth to lead healthy, productive, fulfilling lives. Through mentorship and urban farming, Harlem Grown increases access to, and knowledge of, healthy food for Harlem residents and provides garden-based development programs to Harlem youth. Our relationship with Harlem Grown began last summer and our programs and connections continue to grow. We have held a number of highly successful outreach events with the Harlem Grown community, including hosting a Teaching Kitchen event which offered information about nutrition, healthy eating and growing herbs and our most recent event in recognition of Earth Day, where we helped children from PS 197 plant flowers around their school. 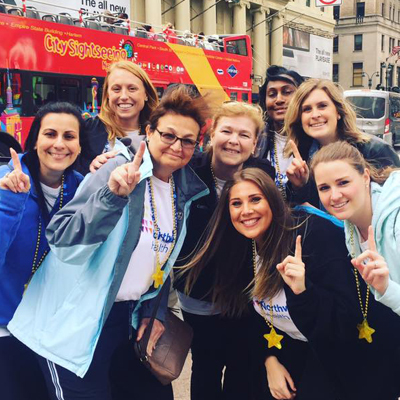 A mix of employees from clinical to non-clinical volunteered to participate in these events and they all have said their experience was as rewarding for them as it was the kids. Personally, Victory Greens has had a profound impact on my life. Through the garden, I’ve been able to connect with colleagues I never would have met. I’ve had the opportunity to make a deep commitment to the community around us as well as to make a sincere pledge to help preserve the environment. 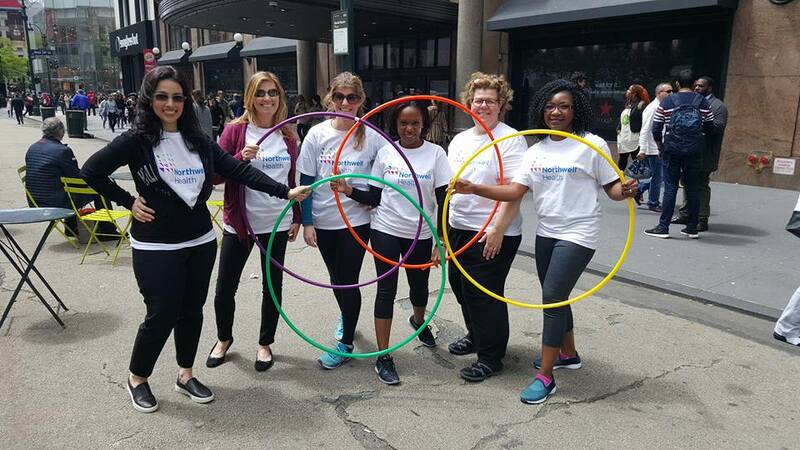 I’ve taken an active role in The GreenBERG, Northwell Health’s Business Employee Resource Group focused on environmentally conscientious initiatives. The mission of The GreenBERG is to improve the environmental impact of our facilities by advancing sustainable and socially responsible efforts across Northwell Health and in our communities. From my involvement with Victory Greens and The GreenBERG, I’ve learned many things and have transformed my view of our planet. I now only wear clothing to work that is made out of sustainable materials, and I have developed a keen interest in trying to resolve recycling and other waste issues that plague hospitals. Who knows what solutions we may ultimately discover, but the magic of Victory Greens seems to be far reaching and highly impactful. 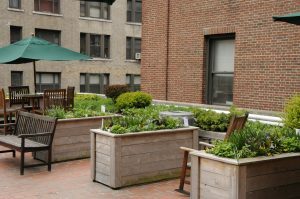 Imagine…all that may, and all that has, come from an extraordinary rooftop garden at Lenox Hill Hospital. Our people have spoken – they think our CEO is the best! As employees of Northwell Health, we’ve always known it. But now, the rest of the world knows that our CEO, Michael J. Dowling is one of the best CEOs of 2017! Based on our employees’ feedback, he has just been ranked among the top large U.S. company CEOs in the 2017 Glassdoor® Employees’ Choice Awards. In fact, he’s the fourth highest ranked health care CEO! It’s no surprise. Because when it comes to building a world-renowned health system, Mr. Dowling is made for this. Glassdoor is one of the world’s largest and fastest growing job sites. Its annual report highlights the Highest Rated CEOs throughout North America. Mr. Dowling’s 91% employee approval ratings are showing the world what we already know: his commitment and passion to our mission. This is a place where we are all empowered and engaged to go further, to challenge the state of health care and to deliver the highest quality care possible. As we passionately live out this vision, we’re delivering significant results. Our nurses’ engagement and satisfaction scores are the highest in New York City. We congratulate Mr. Dowling on this prestigious honor and thank him for making Northwell Health such an incredible place to work. This award is also proof that our highest level of leadership delivers the kind of outstanding performance we expect of all our employees. Are you made for an employer that expects your best and helps you achieve it? Then you might be made for this. Additional details on the results of the Glassdoor survey can be found here. The next chapter in health care. 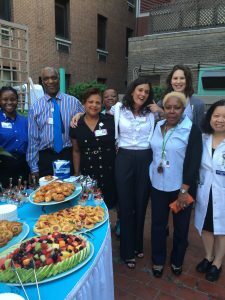 It’s becoming a summer tradition we’re very proud of at Northwell Health: Welcoming the newest talented college juniors who make up the largest class yet in our 8-week Healthcare Management Program (HMP). This year’s program is going to be massive. We had 675 applications from college students all around the country, up from 516 in 2016, and we chose the 26 students who were ready for the challenge of their lives. We also have 15 Northwell Health hospitals and departments participating in the program, up from 10 last year. This year’s interns come from as far away as California, Texas, and Utah, connecting the world of health care in the concrete jungle. And while they’ll spend their summer in hot, humid and slightly magical New York City and Long Island, they’ll get a real-life educational experience that you just can’t get in a classroom setting. Our interns were made for this. We don’t mess around at orientation — and this isn’t a place for paper pushers. This is a place for people who were made for challenges. Our interns set goals to accomplish before summer’s end, and they’ll get the opportunity to prove to themselves, and their mentors, that they were up to the challenge. They’ll experience what it means to run a world renowned health care system. Bringing someone coffee isn’t part of the job description, though at times, they might wish for an IV of it themselves. They’ll get to know us intimately and they’ll discover themselves in the process. And this is only the beginning of their Northwell Health experience. The internship is the perfect stepping-stone to our Management Associate Program (MAP), which is a full time position after graduation. The MAP gives grads a holistic understanding of the business of health care, as well as our overall mission. It’s also one more way students can grow with us and show how they were made for this. Push boundaries. “Embrace new opportunities – even when (especially when) you are out of your comfort zone. That’s when you learn the most about yourself,” – Jenna Tevere, Administrative Director, Emergency Medicine & Surgery, North Shore University Hospital. It’ll be a summer to remember, and one that will push our interns to a new level of performance and success. It won’t come without long days, hard nights and new challenges. But hard work in pursuit of a dream is always worth it. Interested in joining our team? Explore our opportunities for students today. Leading the transformation of health care – our people were made for this! This is no time for “business as usual” or following the “status quo” or any other cliché you can think of. We’re defining the healthcare industry of tomorrow! That means we HAVE to think differently and deliver innovative solutions to achieve results we’ve never achieved before. To make our communities healthier, we’ll need to get out of our comfort zones as healthcare leaders. Above all, we need to drive nursing excellence through highly-engaged leaders. That is exactly what happened at this year’s Nursing Leadership Retreat, “Beyond Boundaries: The Amazing Race to the 90th Percentile”. Held on May 15 and 16, approximately 220 nursing leaders – Nurses Executives, Nursing Directors, Nurse Practitioners, Nurse Managers, and High Potential Bedside Nurses – attended the retreat. The goal – to take our engagement and satisfaction scores to the 90th percentile and beyond! You could tell from day one that things were going to be different. On the first day, we broke from past retreats by engaging participants like never before with games, puzzles and even a scavenger hunt. The participants divided into teams and were asked to explore various companies in the Midtown Manhattan area. Each activity served to challenge the participants’ teamwork, communication, creativity, and awareness of their surroundings. The challenges focused on developing best practices for customer experience, employee engagement, quality standards, and identifying characteristics of the best places to work. On the second day, we heard the insights of a wide variety of exceptional presenters, including Dr. Jim Merlino, formerly the Chief Patient Experience Officer at the Cleveland Clinic and presently the President & Chief Medical Officer of the Strategic Consulting Division at Press Ganey. Dr. Merlino shared his strategies and experiences regarding how to lead an organization in patient experience. He also included Northwell Health specific recommendations in his discussion based on his knowledge of the health system’s Press Ganey performance. Dr. Jim Merlino, formerly the Chief Patient Experience Officer at the Cleveland Clinic and presently the President & Chief Medical Officer of the Strategic Consulting Division at Press Ganey. Dr. Merlino shared his strategies and experiences regarding how to lead an organization in patient experience. He also included Northwell Health specific recommendations in his discussion based on his knowledge of the health system’s Press Ganey performance. Darren Williams, of the Barry Wehmiller Leadership Institute and Simon Sinek who presented on “Finding the CEO in Yourself” and developing the leader in others. They explored who to find fulfillment in watching others actualize their fullest potential. At Northwell Health, we’re revolutionizing every area of health care. If you have a pioneering spirit and a forward-looking attitude, you were made for this. Come be part of it and learn more here. We’re sending shock waves throughout the medical world. What difference can an electrical impulse make in combatting complex illnesses and injuries? Every difference. Bioelectronic Medicine combines our knowledge of electrical signals and neural pathways to redefine how we predict, diagnose, and treat an incredible range of medical conditions. We’re teaching the body how to heal itself – without side effects. Is it possible to set free a person who has been imprisoned in their own body by paralysis? Yes, and we’re doing it. We’re developing devices that create a neural bypass around damaged neural pathways so the paralyzed can regain motion. A lot of what we’re able to accomplish with Bioelectronic Medicine focuses on the vagus nerve. This system of fibers runs from the brain stem to several major organs, including the heart and digestive tract. By identifying the relevant neural pathways and stimulating the vagus nerve electronically, we’re able to provide healing for conditions such as bleeding and many autoimmune disorders such as rheumatoid arthritis, Crohn’s disease and lupus. “Many rheumatoid arthritis patients that had failed multiple pharmaceutical treatments, experienced relief from their symptoms with Bioelectronic Medicine,” says Chad Bouton. Beyond treating existing conditions, bioelectronic devices could have a dramatic impact on our ability to better diagnose disease. By monitoring biomarkers in at-risk patients and listening to the body’s own clues, we can perform real-time diagnostics and track the progress of a patient. This could lead to warning those at risk for cancer, diabetes, and other debilitating dangerous conditions. Give your career a jolt. Our nurses love what they do and where they do it. You can’t argue with the numbers. At Plainview Hospital and Syosset Hospital, our recent employee surveys with engagement percentages in the 90s are among the highest in our health system and show that our nurses love working here. Our employees mentioned the exceptional care we provide and our supportive leadership as key reasons for their high satisfaction. Two great hospitals with one great passion. The more you know about Plainview and Syosset Hospitals, the more you’ll want to grow your nursing career at one of these places. We currently see approximately 35,000 emergency patients per year at our 204-bed teaching hospital. A designated Stroke Center, Plainview is also recognized by the Joint Commission as a Top Performer for Quality Measures for Heart Attack, Heart Failure, Pneumonia and Surgical Care. The Joint Commission has certified Plainview in advanced diabetes and hyperbaric medicine. We also have certification in minimally invasive gynecology. To maintain our high standards, Plainview is fostering an environment focused on nursing excellence with Magnet® status as the ultimate goal. Our 103-bed community hospital is home to the Orthopaedic Center of Excellence, the Davis Vision Eye Surgery Center and the Interventional Pain Management Center. We’re a 911 Receiving Station and a designated Center of Excellence in Minimally Invasive Gynecology by the American Association of Gynecologic Laparoscopists. We’re also a designated Bariatric Surgery Center of Excellence by the American Society for Metabolic and Bariatric Surgery and the American Society of Bariatric Surgery. Both hospitals also serve as clinical campuses for the Hofstra Northwell Health School of Medicine. No matter which hospital you work in, you’ll be part of New York’s leading health system and the state’s largest private employer offering competitive compensation and benefits, continuous learning and educational opportunities and advancement potential. Interested in joining our Plainview/ Syosset team? Explore our unlimited career possibilities today. We’re Truly Ourselves and it makes us stronger. At Northwell Health, understanding and respecting the values and backgrounds of our patients and employees leads to more open communication, an enhanced patient experience, and improved health outcomes. This is why we continually provide an accepting, welcoming and supportive setting for all – especially those within the lesbian, gay, bisexual, transgender and questioning (LGBTQ) community. For the fifth consecutive year, DiversityInc has ranked us as one of the top 12 Hospitals and Health Systems in the nation for diversity and inclusion. We also continue to be recognized as a leader in the Human Rights Campaign’s annual Healthcare Equality Index. We’re pleased to be able to foster and promote EXPRESSIONS, a Northwell Health Business Employee Resource Group (BERG). EXPRESSIONS is comprised of employees who identify as lesbian, gay, bisexual, transgender, questioning (LGBTQ) or who are allies of the LGBTQ community. Through this group, these individuals are able to express their passion for promoting health equity and awareness in a number of ways within the community. We will be taking part in a number of community activities during Pride Month, stop by and say hi, we’d love to meet you. June 17: Employee seating area at Citi Field on the 2nd annual pride night. June 25: NYC Pride Parade with Lenox Health Greenwich Village. Caring for the transgender community. our differences. This and every month we stand proudly with our LGBTQ community and celebrate.